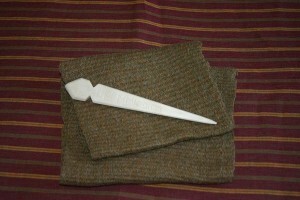 I am interested in textile tools. To that end I have research and built as many textile tools as I can find. 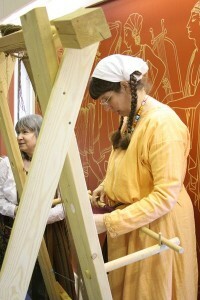 The first large tool I built was the warp weighted loom. For that style of loom, I built a small loom. It is about 7 feet tall by less than 4 feet wide. I designed the loom to fit in my car, because I wanted to take it to demos. The first warp I put on it was brown wool and it was spun in the grease. The yarn fought me every step of the way. 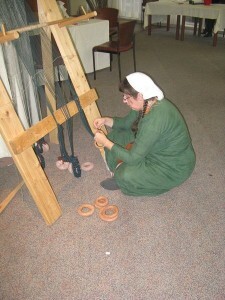 The second warp I put on was that same brown wool, but I washed all of the grease out of it. It behaved slightly better. The third warp I put on the loom was a much finer green yarn. It is still on the loom. After building the loom, I had to build the tools to use it. I have a pin beater that I made from a broken hair stick, unfired clay weights and two sword beaters. The pin beater is bone and it warms to your hand. It is one of my favorite tools when I use the warp weighted loom. In period some weights were fired and some were not. I have a fired set which were gifted to me. The weights work the same. The unfired weights will wear out before the fired weights and they sound different on the loom when they clank together. The important part about loom weights is that they weigh the same with the front set as the back set weighs. My sword beaters do the job but they are clunky and difficult to use. My best story for the warp weight loom comes from a demo at the National Geographic Museum in Washington DC. I fixed up my loom and brought it to the demo. I wore my best dress and all my fancy Anglo-Saxon jewelry. I set my loom up and stuck my hand into the open shed and got stuck. I had worn my dress with tight wrist clasps and the hooks were getting caught in the shed. To make a set of wrist clasps work on a garment the sleeve must be tight to keep tension on the hook and eye part of the clasp. No big deal I would just roll up my sleeves to cover up the clasps. Remember the part where I said my sleeves were tight, well they would not roll up! I spent the day getting stuck in my weaving, but I looked good.